Driving Head Reusable high tensile steel. 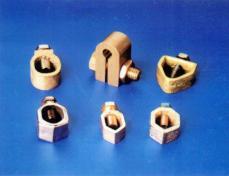 Coupling Brass or Aluminum Bronze. Driving Spike High strength alloy steel. Internal Coupling Phosphorous Bronze or high tensile Brass dowel. CONEX Earth Grounding Rods are made from high tensile-low carbon steel compelling with requirements of BS 4360 Grade 43 A. Each grounding rod is molecularly bonded by 99.99% pure, high conductivity copper bonding's, each rod is treated with Benzol-triozole derivatives. Threads on rods are formed by roll threading process, giving threads extra strength, eliminating risk of chipping the threads while driving the rods in the ground. of Threads Actual Rod Die. CONEX Solid copper earth rods are made in two types. Externally threaded and internally threaded. 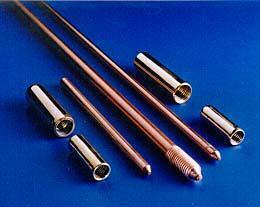 Solid Copper earth rods are used where the factor of corrosion is very high and exceptionally long life is equable. Hence these rods are manufacture from pure and high conductivity hard drawn copper to BS 2874-C 101. These rods are also available with tin plating in order to blueuce the risk of oxidation and increasing shelf life. CONEX manufactures a vast range of Earth ground earthing grounding Rod clamps in Naval Brass, Gunmetal and Aluminium. Special clamp as per customer specifications can also be supplied for grounding rods. .
(A Clamp) Accommodates wide range of Copper / AI tape. (G clamp) Available in light and heavy duty. Accommodates conductor size from 10 mm 2 to 120mm 2 . (Type B) Available with M12 Bolt complete with Brass washer and nuts.